Home Office 365 Group PowerShell How to Recover a Deleted Office 365 Group using PowerShell? How to Recover a Deleted Office 365 Group using PowerShell? Prerequisites: You need to have "Azure AD 2.0" module installed in your machine. You can check if you have azure AD module installed by: Get-InstalledModule. If you have any previous versions installed, You may have to uninstall using "Uninstall-Module AzureAD" and then install the latest version using "Install-Module AzureAD" cmdlet. How to Recover Office 365 Group using Exchange Admin Center? Office 365 groups may get deleted accidentally. Luckily we've methods available to recover deleted groups! If you've deleted an Office 365 group, it's retained for 30 days. After 30 days, the group and associated content is permanently deleted and cannot be restored. In the left navigation, expand "Admin Center" and then Click on "Exchange"
In the Exchange admin center, under "Recipients" tab, Click on "Groups". The group page lists all groups and the status of the groups. Select deleted group that you want to restore and you can view delete time info in the right pane. Click on the "Restore" icon to recover the selected Office 365 group. How to Restore Office 365 Group using PowerShell? This opens the Sign page. Use your Office 365 admin account to login to Azure AD. 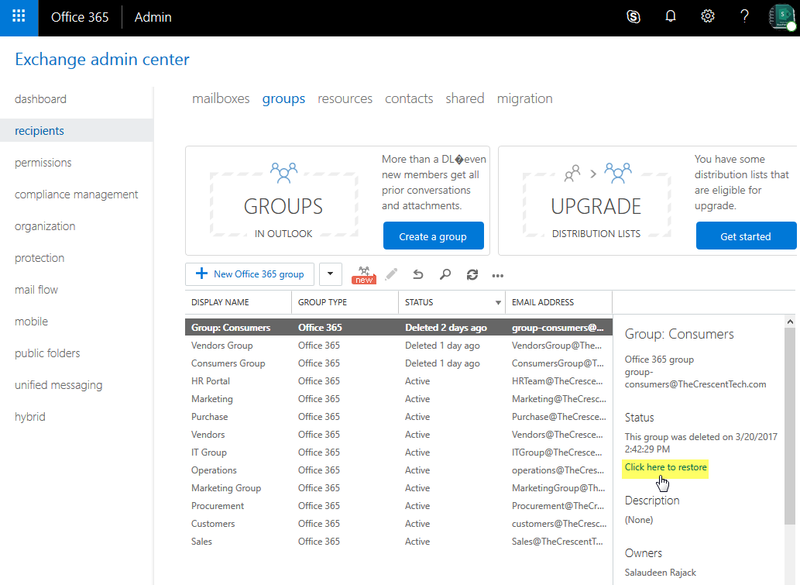 This retrieves all deleted group in Office 365. Note down the ID of the group you wish to restore. Restore-AzureADMSDeletedDirectoryObject -Id "Office 365 group ID"
This usually takes just a few minutes to complete restore.